April 18, 2018 11:30 to 1:00 pm HHH 25 Bring your lunch! 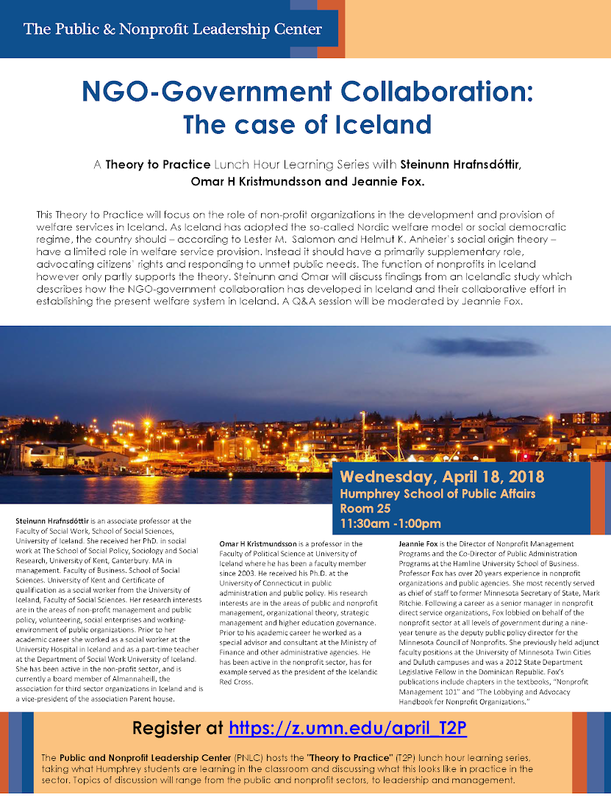 The PNLC invites you to the next Theory to Practice event featuring guests from Iceland sharing their insights on government-nonprofit collaboration. This Theory to Practice will focus on the role of non-profit organizations in the development and provision of welfare services in Iceland. As Iceland has adopted the so-called Nordic welfare model or social democratic regime, the country should – according to Lester M. Salomon and Helmut K. Anheier’s social origin theory – have a limited role in welfare service provision. Instead, it should have a primarily supplementary role, advocating citizens’ rights and responding to unmet public needs. The function of nonprofits in Iceland however only partly supports the theory. 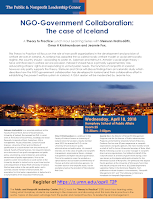 Steinunn and Omar will discuss findings from an Icelandic study which describes how the NGO-government collaboration has developed in Iceland and their collaborative effort in establishing the present welfare system in Iceland. A question and answer session will be moderated by Jeannie Fox. Steinunn Hrafnsdóttir is an associate professor at the Faculty of Social Work, School of Social Sciences, University of Iceland. She received her PhD. in social work at The School of Social Policy, Sociology and Social Research, University of Kent, Canterbury. Omar H Kristmundsson is a professor in the Faculty of Political Science at the University of Iceland where he has been a faculty member since 2003. He received his Ph.D. at the University of Connecticut in public administration and public policy. Jeannie Fox is the Director of Nonprofit Management Programs and the Co-Director of Public Administration Programs at the Hamline University School of Business. Professor Fox has over 20 years experience in nonprofit organizations and public agencies.